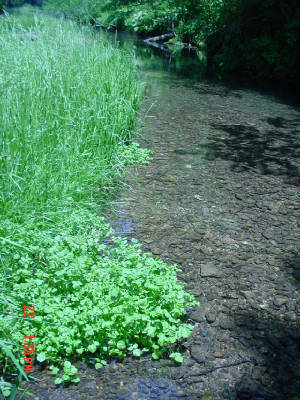 Some of the streams feature watercress you can pick and munch. 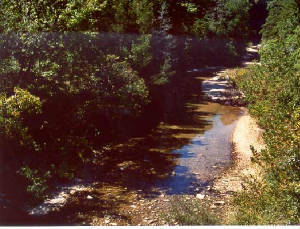 This clump is on the stream right as it comes out of Blanchard Springs, just before Mirror Lake. One of the best places to see wildlife is walking in the creeks. This is the North Sylamore below the bridge at Gunner Pool. Most of the creeks are shallow and gravelly, and you can just stroll along in a bathing suit and wet sneakers (tough Hawaiian slippers fine). 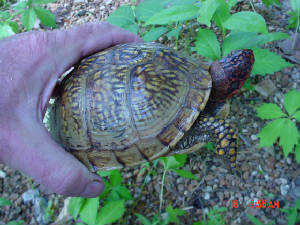 In early summer you will find box turtles crossing the roads. I picked up this guy (males have red eyes) and released it on “Hibernation Hill”. If you look closely on the shell near my thumb, you can see I have written “Ray 5-05” with a grease pen. 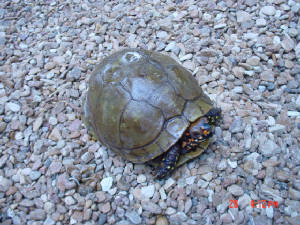 Another turtle from the roads. I called this one black nose. I don’t know the name of this flower, but it was quite common and in full bloom about mid-May 05. 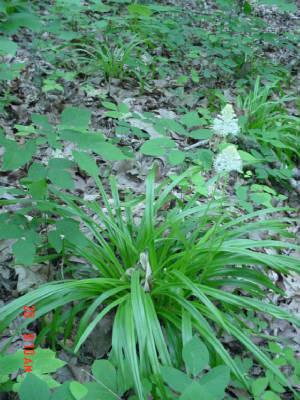 Note the poison ivy (3 leaf plant top left). 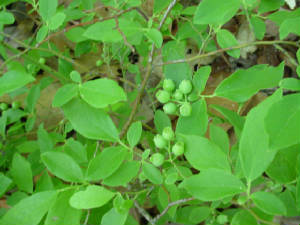 There are also ticks and chiggers in the underbrush. 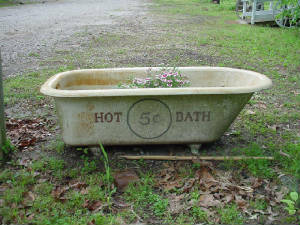 All three of these can be mostly washed off with soap and water, and the sooner the better, so let’s go swimming! If you walk on trails or in streambeds, and don’t touch the plants, you can be in a bathing suit and never have a problem.